Volunteers like Shahlo Kholmatova, right, teach Tajik families about health, nutrition, sanitation, hygiene, and home gardening. Photo by Komilova Khosiyatkhon. They're retirees, health workers, mothers-in-law, and more—and they're perfectly positioned to find the families most in need. Momakhol Bobokalonova’s father forbade her to study past the seventh grade. Momakhol is one of about 2,000 volunteers with the IntraHealth International-led activity, known as THNA for short. They include retirees, teachers, health workers, village and jamoat (or town) chairmen, religious leaders, mothers-in-law, housewives, and the most authoritative personalities in the villages. Their goal is to help improve overall health and nutrition in Tajikistan—particularly for women and children in the Khatlon oblast, the most populous administrative region. “Thanks to volunteering, I left my village and saw the center of our region for the first time," says Momakhol Bobok. "Everyone in the village started calling me 'teacher'." Photo by Komilova Khosiyatkhon. For more than three years, the volunteers have been visiting families in their villages and teaching about health, nutrition, sanitation, hygiene, and home gardening. They demonstrate how to prepare healthful foods for pregnant and lactating women and for children over six months old. They organize mutual support groups for mothers-in-law, daughters-in-law, and men. And, in close cooperation with professional health workers, they search for stunted and wasted children, children with diarrhea, and pregnant women who are not receiving antenatal care. Then they help connect these clients to public health centers. 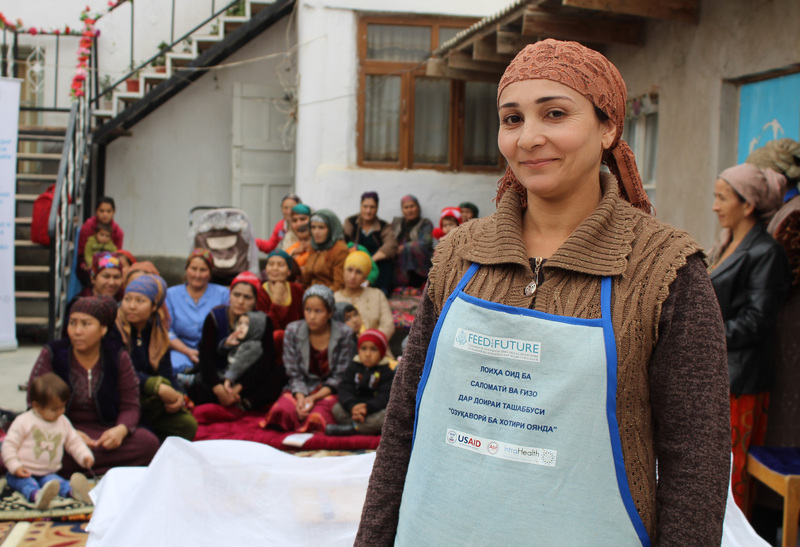 The program not only links more Tajik women and children to the health system, it also educates and empowers volunteers, about 80% of whom are women. I know every woman, every family. No one knows my village better than me. THNA volunteers are divided into public health workers and agriculture workers. At monthly meetings, THNA staff help improve their knowledge and skills on exclusive breastfeeding, supplementary feeding for children under two years old, nutrition for women of reproductive age, modern agricultural technologies, proper storage of crops, and more. Because the volunteers are part of the communities they serve, they’re in the perfect position to help find the families most in need of care. Kurbonbi Safarova (fourth from right) with her husband, Alijon Safarov, and family. Kurbonbi and Alijon created their own ambulance system for their rural community. Photo by Komilova Khosiyatkhon. The volunteers are also able to mobilize resources from within their communities to help connect women and children to services. Bakhriniso Karaeva from Chuponobod village called on neighbors for transportation help, too. This year, IntraHealth held a competition for THNA volunteers—the first of its kind. Our team invited participants to come share their stories and experiences working in the community for a jury of local district leaders, including the chair of the committee on women's and family affairs, leaders of healthy lifestyles centers, and public health center managers. Some 350 volunteers from 12 western districts vied for the title of Best Volunteer. We could not separate one of them as the best. For today we have 24 best volunteers (including 12 community health providers and 12 community educators). We’ll hold a regional contest in mid-March dedicated to the Tajik national holiday Navruz. The Feed the Future Tajikistan Health and Nutrition Activity is led by IntraHealth International with funding from the US Agency for International Development.